QUARTILE Function in Excel returns the Quartile value for a supplied range of values. 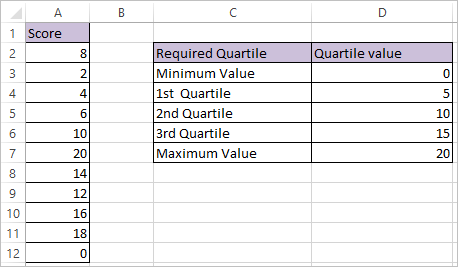 QUARTILE Functions in Excel returns minimum value, first quartile (25th Percentile), second quartile (50th Percentile), third quartile (75th Percentile) and max value (100th percentile). array – The array of data values for which you want to calculate the Quartile.